By hungry runner on November 28th, 2010 . Filed under: Cupcake Ideas . When I was growing up I always loved when we had make-your-own ice cream sundaes at school. So naturally I loved the idea of a DIY Cupcake Topping Bar. This Build It cupcake bar was featured on Green Wedding Shoes and is based on a fall theme. 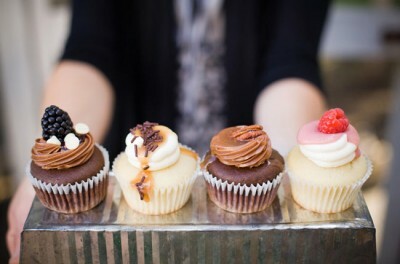 I really love the idea of a topping bar because it allows guests to create their own unique cupcake! 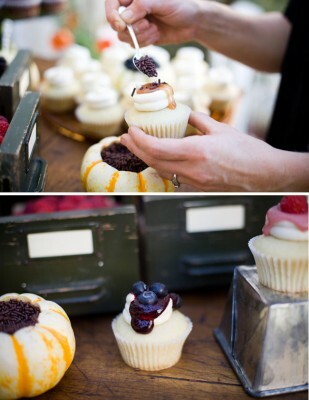 For this cupcake bar, the cupcakes were frosted with a ring so that the toppings, which included syrups in vintage syrup dispensers, could be added to the whole in the middle. I especially liked the idea of using mini hallowed out pumpkins to serve as “bowls” for a toppings, such as sprinkles. The possibilities of toppings for cupcakes seem endless which means you could get really creative with what you put out for guest to top their cupcakes with.